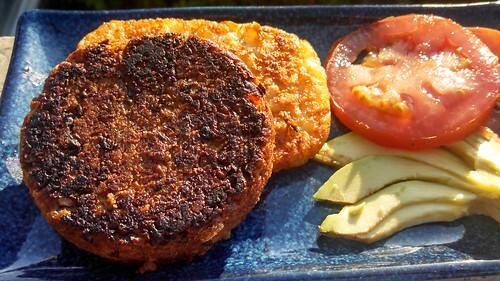 The newest entry into the Great Gluten-Free Vegan Burger Experiment is an attempt to make the BBQ Black Bean Burger from Joni Marie Newman’s cookbook, The Best Veggie Burgers on the Planet. I say “attempt” because some things didn’t quite go right, but that’s the whole point in experimentation! The recipe is gluten-free to begin with, calling for 1/2 cup of soy flour. I assumed we had soy flour and so progressed along with soaking the TVP and adding it with the black beans to a bowl. This would be when I remembered the soy flour. Quinoa flour, fava flour, besan (chickpea flour), 3 kinds of gluten-free flour mixes, millet flour, almond flour… and…. soy milk powder. At this point I decided my track record with using gluten-free instant oats had been pretty good and subbed them in for 1/2 cup soy flour I did not have. Although I decided to start with 2/3 of the BBQ Sauce called for in the recipe, it still seemed very wet. 1/4 of potato flakes was added and I didn’t add in the final 1/3 of the BBQ Sauce called for. Since I’d gone with oats + potatoes, I wasn’t sure if the fridge might inhibit the water those would soak up, so I let it sit at room temperature in the microwave (a.k.a., “cat safe”). I’ll admit that I wanted to try baking in the drop-biscuit cast iron since it has been working so well to make very nicely shaped, cooked burgers. That perhaps isn’t a big deal, but I did try to get tricky and cook them at the same time as the french fries. So shorter time, higher temp. At the halfway point I realized I couldn’t really flip them easily. Nor at the end point. Since the fries too seemed a little off, I switched the oven onto the convection setting and stuck everything back in for 5 minutes. Fries out, burgers another 10 minutes at 325F convection setting. They set up some in the pan, but we finally ate them. Still a little mushy, but way tasty. The burgers sat in the cast iron for a bit, until they cooled and I put all the leftovers away. By that time they were very nicely set. This morning I had one along with a hashbrown patty from TJ’s, slices of the volunteer tomato that showed up in my zinnias, and a little avocado. This experiment will be attempted again, this time using soy flour and really watching the liquid added to the TVP. I did sauté the onions, since they were very strong, which may have made for more moisture too. I do really like using the oats, but will see how the soy flour and refrigeration works before changing anything. Something just seemed too wet with this version using oats, even through they ended up as well shaped burgers that reheated nicely and hold together well. I will add one to the freezer collection as well to see how it does with thawing. It may be these are a “make ahead” burger (the variation with oats), so they bake, set, and are lightly cooked again to heat through. Next post: Want Fries with That?